Today, we unite two old things that continue to deserve a spot in my closet. Cost per wear for these two is approaching zero . . . which provides balance for some of the impractical delights of my wardrobe. Things like this and this. 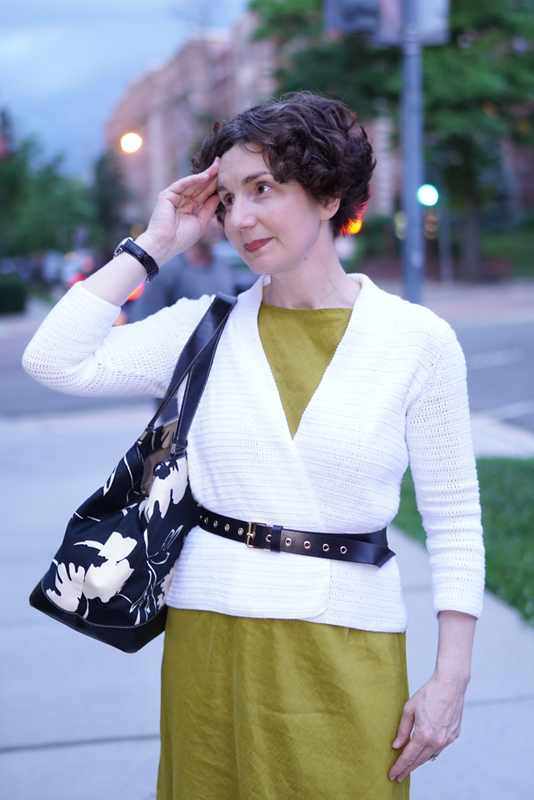 Witness my old Eileen Fisher open cardigan (resuscitated with a belt in A Very Old Cardigan, Part I) paired with my old Eileen Fisher bias-cut, raw silk dress. 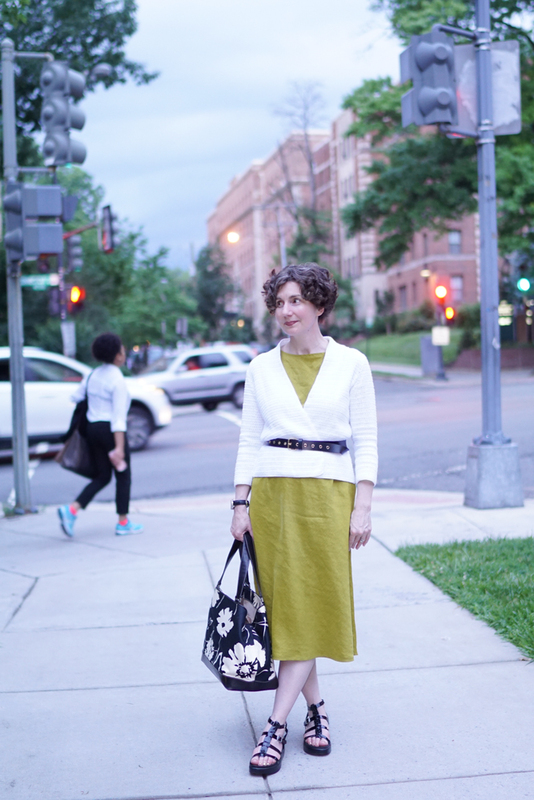 This dress earns a spot in my closet every day just by virtue of being the perfect weirdy green. 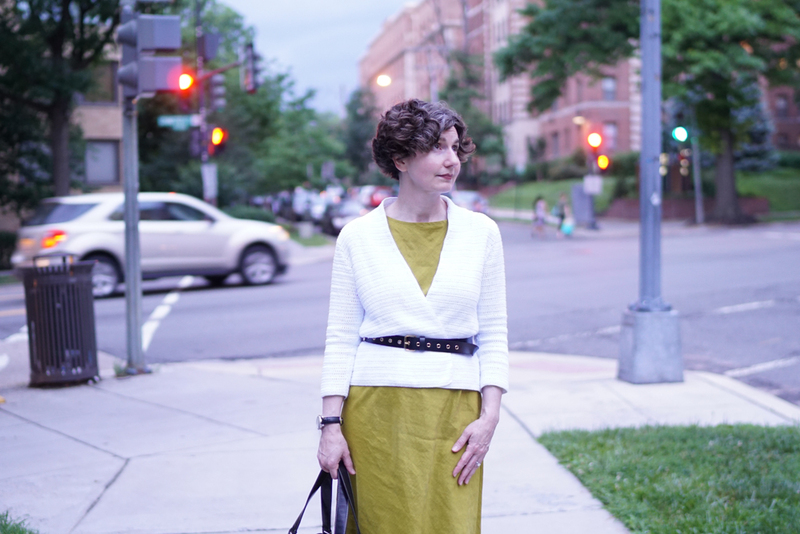 About a decade ago, Eileen Fisher made this dress — a simple, bias-cut tank dress — in linen and silk, in at least a half dozen shades. It’s such a staple that I think it should be fabricated every year, but no one listens to the voices in my head. This type of dress is back in this year and I found something very similar from Ganni in an intense orange. An orange too intense to resist. Is this one of my art teacher outfits? This belt gets the assist, again. I never imagined it would be so versatile. 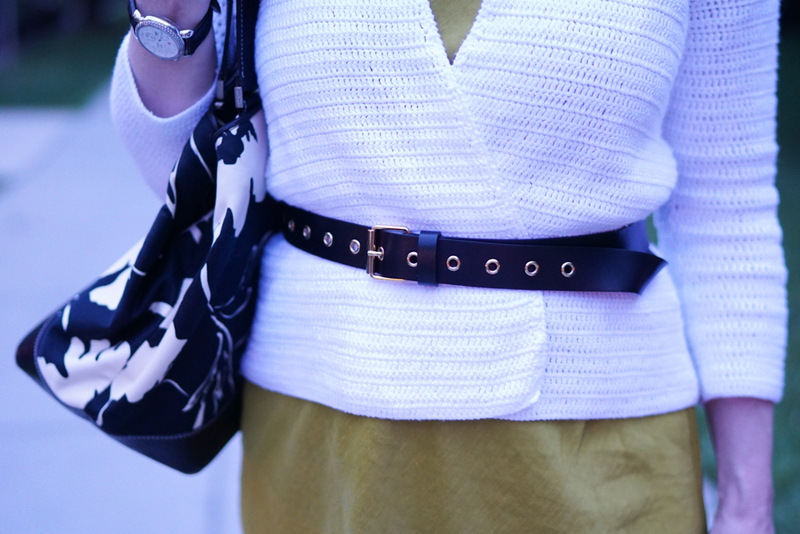 As you can see, this belt is long and I have tucked the excess length into the strap. It might be better if I had a detachable loop fabricated. I don’t think it even needs to be leather. A black grosgrain ribbon or matte satin (is that a thing?) might work nicely. Finally, the gladiator sandals — which look like more shoe than many summer sandals. How does being cut on the bias effect the fabric and thus, the dress? 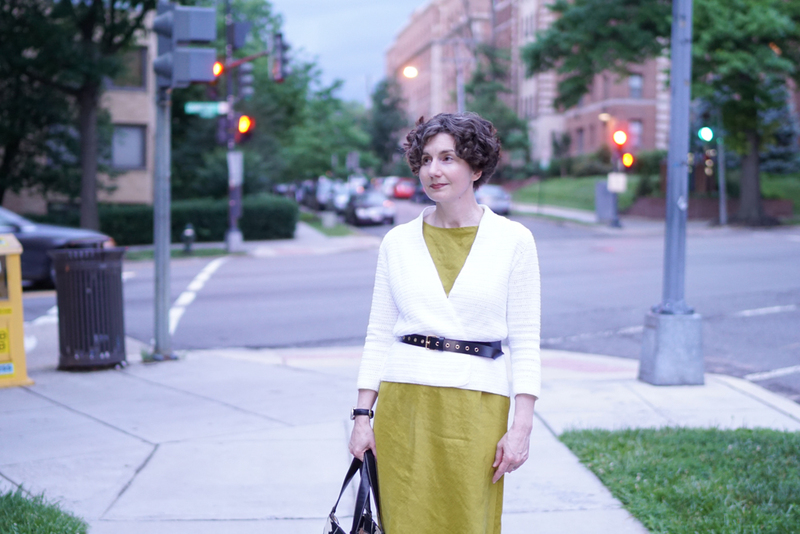 I like coupling the sweater and belt as the dress gets a boost from both. Shoes are great! Always love the weirdy green! Let us know if you find more during your internet perusals. 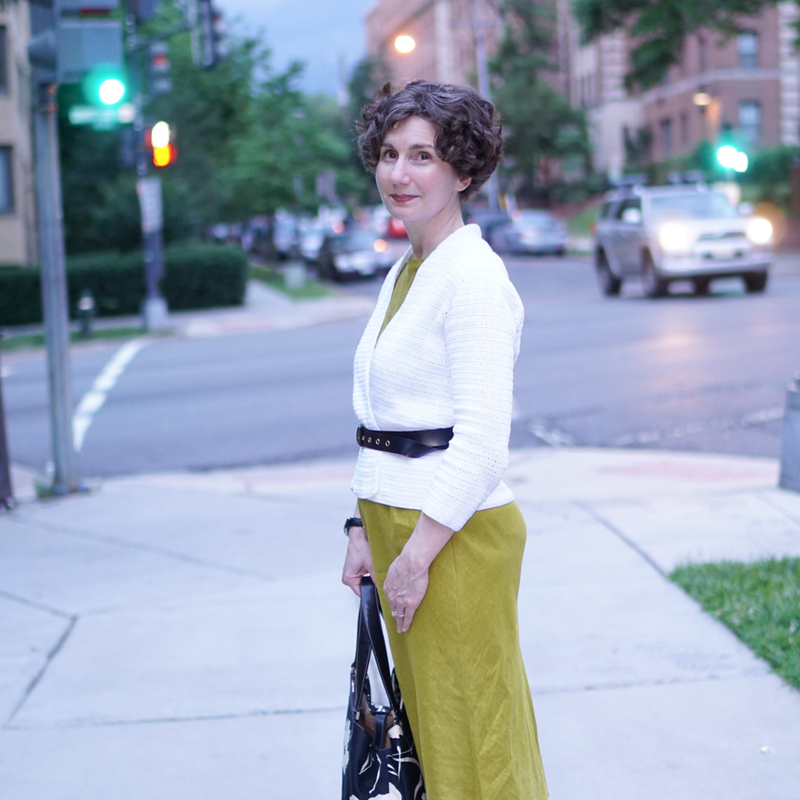 I love the quality of Eileen Fisher. I find hers are the pieces I hold onto when cleaning out my closet. I don’t think there’s really anything truly classic, but since her stuff isn’t trendy either, I never think it looks terribly dated. The neckline and length of the dress is perfection. Altogether a very nice looking outfit.